4 kg - 19.79€ (4.95€/Kg) 15 kg - 49.99€ (3.33€/Kg) 2 x 15 kg - 2 x 48.95€/un. 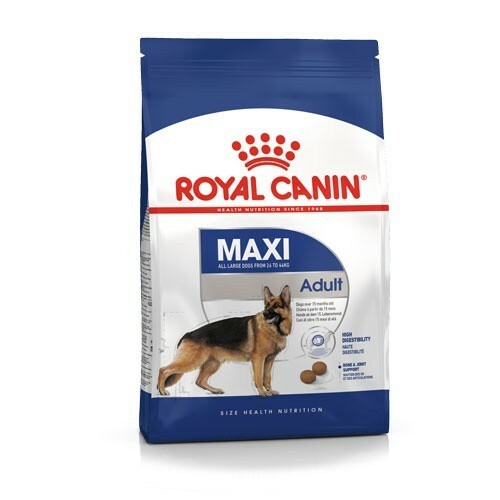 Royal canin maxi adult is a food for adults aged between 26 and 44 Kg dog that helps maintain ideal weight and an optimal state of health from 15 months to 5 years. The big dogs suffering from the effects of early agingadult: sensitivity in the joints, heart problems and digestive disorders. 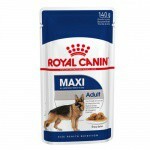 Maxi Adult large breeds dogs provides a specific nutritional solution that palía the effects of premature aging. The feed is ready to serve. It is important to respect the recommended daily ration and always leave abundant fresh water and clean at the disposal of the dog. Highly digestible ingredients (poultry meat dehydrated, Corn gluten, dehydrated egg) which ensures a maximum intake of nutrients. A moderately fermentable fiber input allows limiting the fermentative activity and nurture the bacterial flora. A contribution not fermentable fiber allows to improve the transit and the consistency of the stool. Contribution of chondroitin, Glucosamine and omega series 3 fatty acids (EPA/DHA) contributes to the maintenance of healtharticulate. Conducive to the smooth functioning of the heart due to the addition of taurine, which stimulates cardiac contraction. 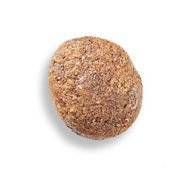 The Polyphosphate of sodium, present on the surface of the croquette, acts salivary calcium chelating and limits the formation of fur. Maize, meat of dehydrated poultry, flour of corn, animal fat, liver bird, gluten, corn, flesh of sugar beet, mineral salts, yeast, vegetable oils, fish oil, trace elements (including chelated trace elements), L - tyrosine, sodium Polyphosphate, egg dehydrated, hydrolysate of crustacean (source of Glucosamine), hydrolysed cartilage (source of chondroitin), vitamins.